Antique French farmhouse tables provide some of the finest examples of 19th century craftsmanship and are very much our area of speciality. 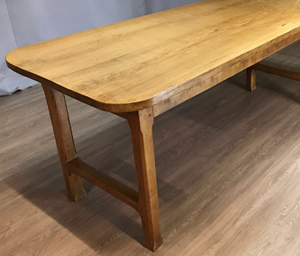 From our showrooms and on-site restoration facility, conveniently located between Billingshurst and Wisborough Green in West Sussex, we have developed an expanding clientele from across the UK, Europe and the United States, who have been drawn to the idea of a fine French farmhouse table. It’s easy to see why! These solid antique wonders can, by their sheer presence, elevate any large country style kitchen, dining room or even spacious conservatory. Our lovely tables can easily blend with modern and contemporary décor, transforming a room into an elegant and welcoming space, often in ways that modern, minimalist interiors fail to achieve. farmhouse table production was widespread in the Gallic region. Every individual item was handmade and, consequently, unique in design. No imitations. No replicas – just originals. They were crafted in a wide range of woods, sizes and styling. Music to the ears of the present day buyer seeking individuality in their choice of furniture! Our choice of tables is all encompassing. 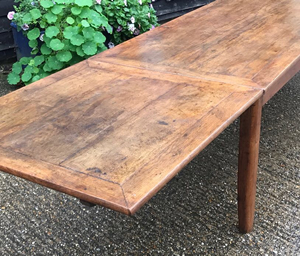 We regularly uncover a mixture of darker and lighter grain antique French farmhouse tables including traditional oak, beech, ash, elm and pine, as well as sought after fruitwoods; cherry, pear, apple and even walnut being the most common examples. When finished, perhaps with a subtle, protective coating, they can all look truly stunning – offering a reassuringly welcoming appearance that draws the eye. Yet these antique tables needn’t work in isolation. They can effortlessly add balance and harmony when placed alongside both traditional and modern décor – even set against the most colourful seating. Versatility par excellence, you might say! Every table we source has a story to tell. We often come across examples that require a certain amount of restoration to protect the patination and return faded glory, whilst in others it’s possible to detect that they’ve already undergone a degree of ornamentation or repair to the wood, which has revitalised the furniture. 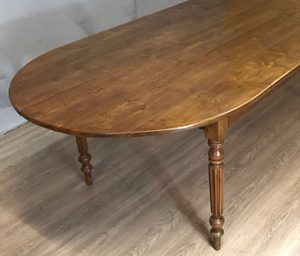 Every piece will require individual attention but, rest assured, your specific antique farmhouse table will be delivered oozing charm and character. With that ‘je ne sais quoi’ French elegance and unquestionably “built to last” appearance, a traditional French farm table is generally sizeable enough to cater for between 8-14 people at a time - the perfect bedrock for any formal or informal social gathering - providing a reassuring and classy presence in the home, boutique hotel, restaurant or other eating and meeting place. And if al fresco dining happens to be on your menu, then an extensive and solid looking French antique charcuterie table can underpin the most convivial of settings in which to entertain your guests. Whatever the location, you will obviously require sufficient space to accommodate your table. But, if you do have the space, then the occasion should take care of itself! Depending on your taste, a rugged oak beech farmhouse table with minimal styling and a simple scrubbed finish is always destined to impress. What about a warmer, richer finish, seen in an exquisitely polished cherry wood? That would certainly make a statement! And if you are tempted to introduce further character, then a table with shaped legs or even drawers would provide extra focal interest, as well as a great talking point. Just who was rummaging around in those drawers 150 years ago, you might ask! You may wish to go to town on decorative detailing, e.g. tables with skilfully turned and rounded legs or finely carved features. 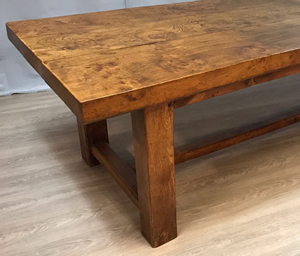 Carefully chosen with our assistance, there are so many styles of French antique farmhouse table to suit your taste. We find many of our clients don’t necessarily have the room to readily accommodate a 12 seat antique French farmhouse table. But this needn’t be the end of your search. A number of tables we acquire were originally designed with restricted space in mind. They were made as extending tables, with the smaller base table for everyday use, easily extendable for larger gatherings. Giving you the best of both worlds! Your journey into the wonderful world of antique French farmhouse tables begins here.